Most people don't know that there are three different types of Alaskan king crab. You have red, blue and brown king crabs. One of the main reasons for you not knowing the difference is that most retail markets will offer the the brown crab because of the lower price they have, compared to the red or blue king crab. Alaskan king crab are also graded in different sizes which will affect the price you pay for them. The legs are graded by the number of legs per 10 lbs. The standard counts are 6-9, 9-12, 12-14, 14-17, 16-20, 20-24, and 20 and up. So for an example a 6-9 means there are 6 to 9 crab legs per 10 pounds. Now these would be huge legs, averaging about 1 1/3 lbs. each. Now let's take a look at the varieties of king crab to help you when shopping for your next king crab dinner. Red Alaskan king crab, when caught and alive are a dark burgundy in color. The shells will turn a bright red when they are cooked. The meat is snow white with highlights of bright reds on the top part of the meat. Reds are known for being the sweetness of all king crab. Blue king crab when cooked is a bright orange red and all though not a true red king crab they are marketed as red king crab. The taste is real close to the actual red king. Brown king crab when cooked has a more orange to a brownish shell and duller look to them. Brown or golden king crab, as they are sometimes called are good eating, but not as sweet as the other two types of crab. If you can find some reds, treat yourself to them, they are the best you can get. Larger legs will yield more meat per pound. 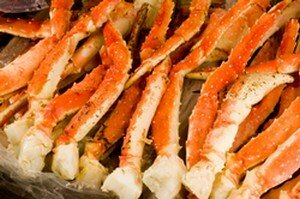 The folks over at the Crab Place offer large king crab and jumbo king crab legs.